Between the haunted houses, the creepy decorations and the spooky costumes, Halloween is one time of year that we all love to be a little frightened. Unfortunately, however, the scare doesn’t always stop there. If you go all out on all of your Halloween gear, the fright might extend to your bank account as well. Thankfully, it doesn’t have to. Here are seven ways to save big on your kids’ Halloween costumes this year. You might be surprised at the number of costumes you can make using items you already own. For example, if your child already has a toy tool belt and tools , he could go as a construction worker. If your daughter already owns a beautiful white flower girl or christening dress, she could go as a bride. When it comes to Halloween costumes , you often get what you pay for. If your child will only wear the costume once, going cheap is fine. If you have multiple children and you intend to hand the costume down, however, choose a timeless and quality costume that will last for years. If you are crafty, why not make your own costumes? You can make a poodle skirt by cutting a very large circle out of a piece of fabric, cutting a circle out for the waste, and sewing in some elastic. Pirate eye patches , ghost costumes and spider costumes are all super easy to make as well. Instead of purchasing an entire costume, why not choose costumes that only require accessories? For example: Cat costumes only need black clothes, ears and a tail. Chef costumes only require a whisk and a chef’s hat. Artist costumes only require a set of paints and a beret. Ninja turtle costumes only need a shell, a weapon and a piece of fabric for a mask. Whether you choose to purchase an entire costume or just pieces, be on the look-out for great deals. Many Halloween stores have coupons and promotions that allow you to get a great costume for cheap. You can often save big just by checking out the deals. Since most children only wear their costumes for one night before they are done with them, it is very easy to find like-new Halloween costumes for cheap. Check Ebay, Craigslist, garage sales and your local thrift stores or consignment shops. You never know what you might find! Your options will be a little more limited this way, but you are sure to get a great deal, so it is definitely worth a look. If you can remember and afford to plan ahead, November is the perfect time to purchase Halloween costumes for the next year at great prices. Pick up a costume or two when they are severely marked down on clearance, and you’ll be all set well before the next Halloween rolls around. Halloween is a ton of fun, but that doesn’t mean that it should cost you a ton of money. Use these seven ways to save big on your kids’ Halloween costumes this year, and save the frights for the haunted house. Your kids will have amazing and unique costumes that they will be proud to show off at a price that you can afford. 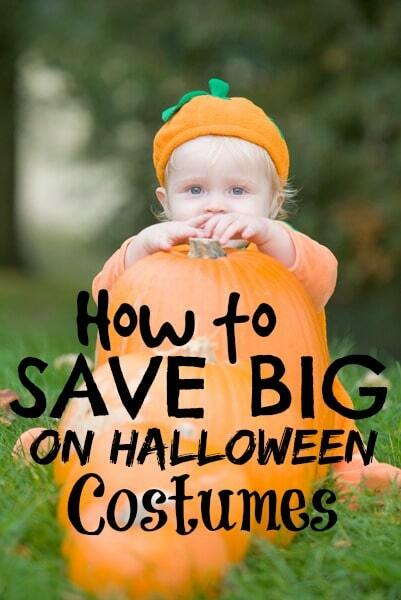 How much do you usually spend on Halloween costumes for your kids? What tips do you have for getting a great Halloween costume for less?